In a year full of close, hard-fought, heart-stopping victories, the 10 point win in week 9 over the Denver Broncos was a relative cake walk. The offense–and particularly the rushing offense–deservedly garnered the Lion’s share of the credit for the win, but as is generally true in the NFL, it was a Team Win where the passing offense was key to maintaining ball control and to exploit some weaknesses in the Denver secondary. More importantly, the defense played a major role in this victory. It is no secret that the defense was having numerous problems throughout the year, made all the more visible and disheartening because QBs like Matt Ryan, Drew Brees, and Philip Rivers were busy disecting it, not to mention running backs like DeMarco Murray and Spencer Ware running wild on the defensive front. In Week 9, the defense showed up. First by absolutely smothering the Denver rushing offense, and then when HC Gary Kubiak and OC Rick Dennison abandoned the run, the defense was able to limit the Broncos’ passing attack. 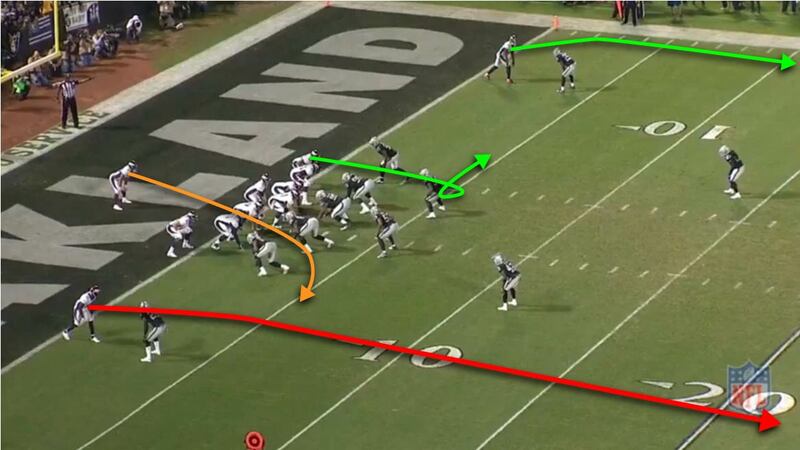 Here is a look at the evolving Raiders’ coverage scheme. Perhaps the most intriguing aspect of this part of the defense is that it is not just the players that are growing used to the system, but it is the system that seems to be growing, adjusting, and adapting. Ken Norton Jr famously comes from the "Seattle Cover 3" system and Jack Del Rio often used a Quarters coverage. The Raiders’ defense is starting to show both of those coverages as well as showing some indications that they may be trying to work Cover 3 concepts into the Quarters coverages or vice versa. The week 9 defensive performance seemed very solid and it felt for all the Raider Nation that the defense had arrived. Here’s a look at seven interesting defensive coverage plays that highlight some of the good as well as showing that there are still some adjustments and growth in play. 3-10-DEN 14 (14:50) (Shotgun) T.Siemian pass incomplete short middle to D.Thomas (R.Nelson). Quick Description : Quick DJ playing off. Demaryius Thomas runs a quick underneath route. There’s a little bit of a natural pick in the middle of the field that has DJ screened away. Reggie Nelson eyes the QB, reads the route, and delivers the big hit on Thomas to jar the ball loose. 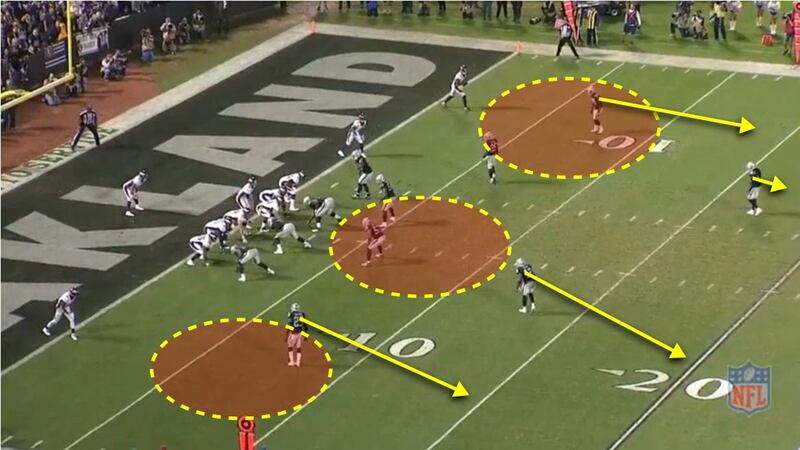 Notes : The Raiders are no longer a predominantly Press Man Cover 1 team of old, but both Amerson and Sean Smith have very good press coverage skills and Norton will definitely use Man Coverage at times, most notably when blitzing. It’s no secret that Reggie Nelson has struggled early in the season. But as of late, he seems to be growing more comfortable and seems to be playing faster. 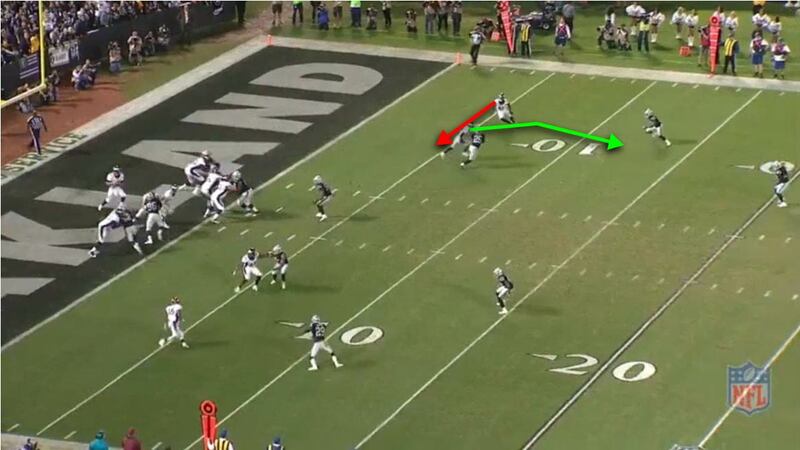 This may be in part to learning the coverage and it may also be in part due to Ken Norton using Nelson in a more comfortable way. Here, he is playing the Strong Safety position with Karl Joseph manning the deep middle. 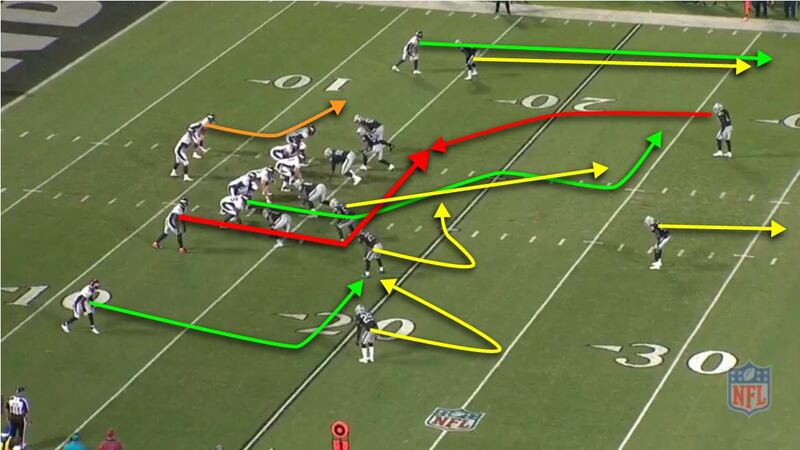 On 3rd and 10, route combination appears to expect zone and is attacking the underneath middle zone. Likely trying to play field position with a safe underneath throw. Man coverage with Karl Joseph playing single deep free safety. Reggie Nelson on the defensive right drops down and reads the route. DJ was playing off and allowing a free release to Thomas. When Thomas breaks to the in, Hayden is in chase. Fortunately, Reggie Nelson is there to make the big blindside hit on Thomas. 1-10-DEN 24 (10:16) T.Siemian pass incomplete short middle to A.Derby (K.Joseph). Quick Description : Playaction draws all the underneath linebackers and leaves safeties in true 1-on-1 man coverage with TEs. QB naked bootleg is played well, but Siemian has time to scan the field and throw. Karl Joseph makes the nice play to breakup the pass. 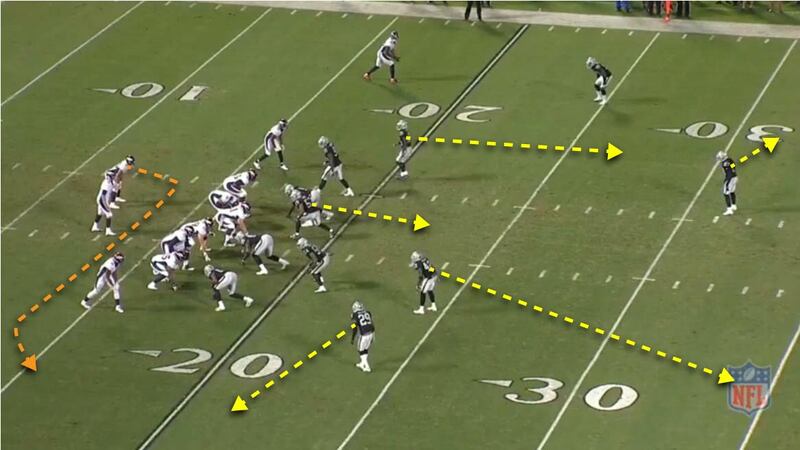 Notes : This shows Karl Joseph’s man coverage and instincts; this is crucial for the Quarters coverage that seems to be growing increasingly important in the Raiders’ defense. LBs get caught up on the playaction fake. Perry Riley gets 2 yards into the backfield before recognizing the play and Malcolm Smith gets caught in No Man’s Land. Safeties expected underneath help from LBs to take away passing lanes, but instead were left isolated. Double move on the outside (out and up) v Amerson may have gotten free, but Mack was closing so Siemian wasn’t looking for it. And he may not have the arm to make that throw. Outside clearout routes and Over routes on the inside. Safeties (and LBs) have complex rules but in this case, ends up as having over-the-top man coverage while expecting help underneath. Siemian bootlegging with Mack playing it well. Tight End routes cross the field with Siemian at two levels. Karl Joseph and Reggie Nelson have over-the-top duties and expect the LBs Perry Riley and Malcolm Smith to give help underneath. As Siemian scans to throw, clear gaps in the field appear because of the LBs. Having the LBs out of the way does two things. 1st, takes away the coverage help. Ideally, there is High/Low bracket coverage on these TEs in the middle. 2nd, taking bodies away and out of the passing lane gives Siemian an easier view of the field and less worry about throwing to a "hidden" defender. The safeties play this well and Karl Joseph makes a very nice play, but in the future, the LBs are going to have to be more disciplined and quick to recognize pass to help on these types of plays. 1-10-OAK 36 (8:31) T.Siemian pass deep right to J.Norwood for 36 yards, TOUCHDOWN. 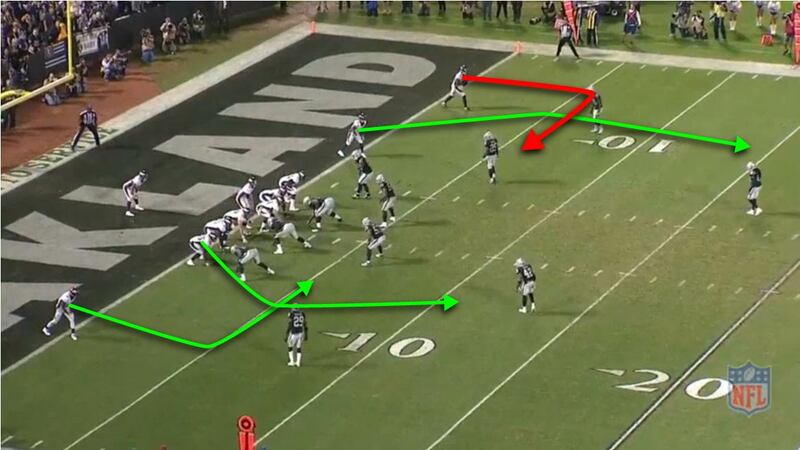 Quick Description : Cover 3 deep and David Amerson gets caught up with the underneath pivot route, while the quick slant-and-go gets into the deep secondary quickly. Karl Joseph has inside leverage as he is playing deep middle third and he cannot make the play on the deep pass to the sideline. Notes : Cover 3 is a 3 deep, 4 underneath zone. 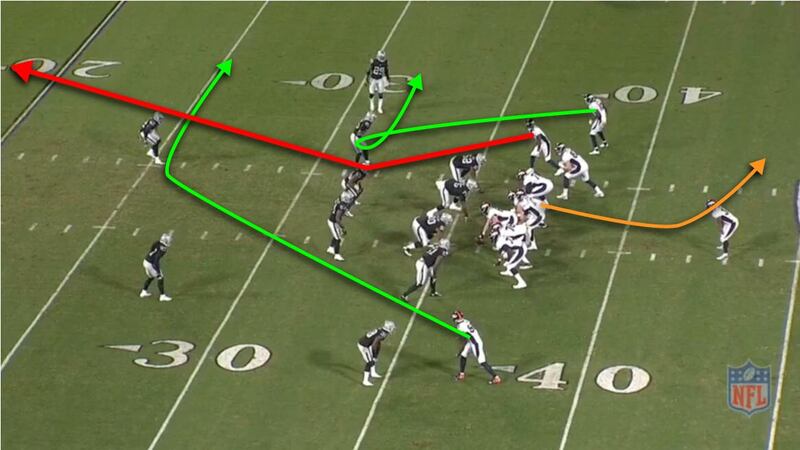 In this case, it is played 3 deep and 3 underneath with Reggie Nelson playing man coverage on Demaryius Thomas. This appears to be a new coverage or one that I have not noticed until now. 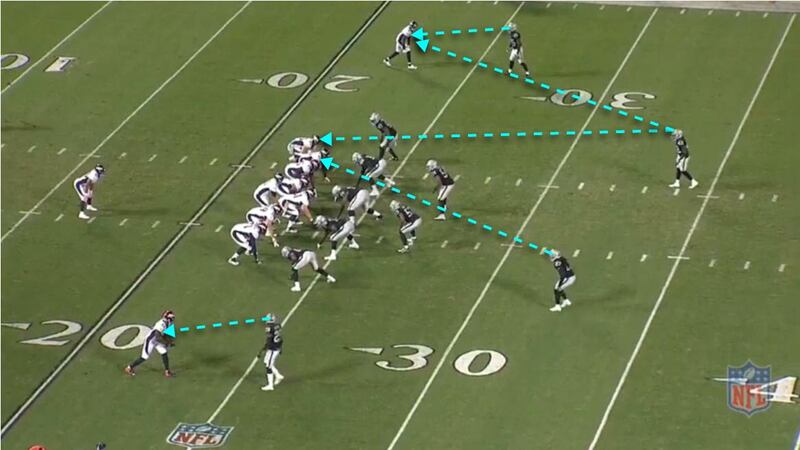 This coverage seems to be a hybrid of Cover 3 and Quarters coverage. The rules for Reggie Nelson’s coverage are likely fairly complex and allow for him to provide support in some case and to take man coverage in others. LBs do a very good job of recognizing the pass and then dropping into zones. 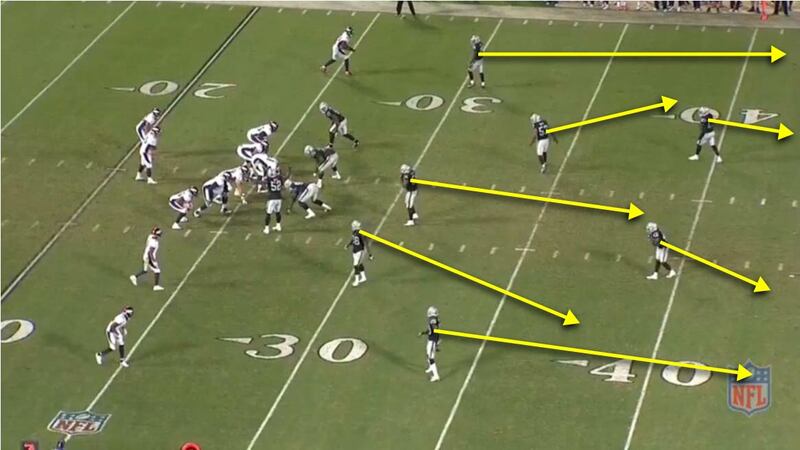 The defense appears to have this perfectly played except for Amerson’s missed assignment. This coverage is one to keep an eye out for. Will this be used often in the future? QB bootleg has three levels to throw to. 6 defenders take the 3 underneath and 3 deep zones. Meanwhile Strong Safety Reggie Nelson on the defensive right will take man coverage on Demaryius Thomas when he breaks horizontally. Siemian bootlegs and sets. Khalil Mack plays it well and Siemian has only a moment to read and throw. Amerson eyes the underneath route and loses track of the deep fade, which leaves a big gap to throw into. Siemian may not have a great arm, but this is an easy throw. 1-10-DEN 2 (8:49) T.Siemian pass incomplete deep right to E.Sanders. Quick Description : Speedster Emmanuel Sanders trying to duplicate Brandin Cooks’ 99 yard TD play, but this time, Amerson and Karl Joseph have him well covered up. Notes : Quarters played perfectly and show one of the benefits of playing this coverage, the double team on the outside receiver. Karl Joseph’s feel for NFL speed continue to improve and he’s running with Sanders. There’s nothing else available either and Khalil Mack is going to kill Siemian if he holds onto that ball. Two short checkdown routes and two deep routes. 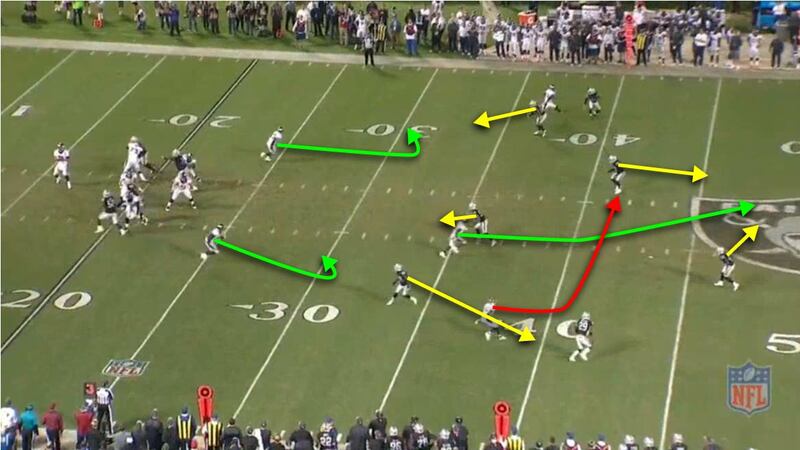 Quarters allows for safeties to double on outside receivers if inside receivers run underneath routes. There’s nothing there and the best Siemian can do is throw it so it doesn’t get intercepted. 2-10-DEN 2 (8:43) T.Siemian pass short middle to D.Thomas to DEN 8 for 6 yards (D.Hayden). 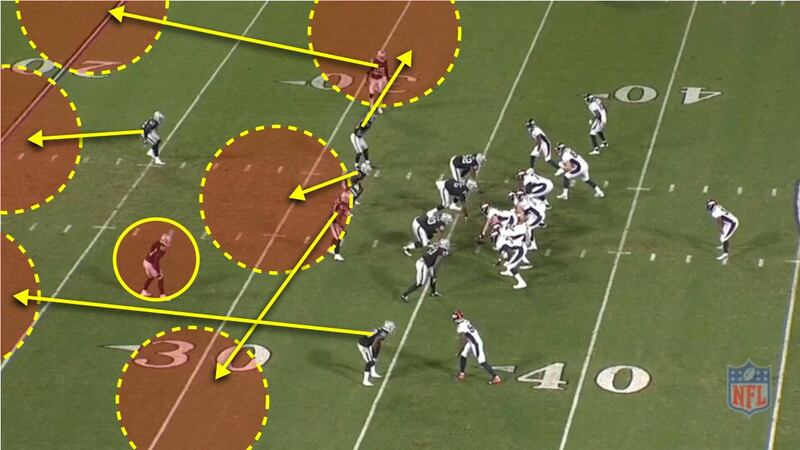 Quick Description : Broncos running a natural pick play. DJ recognizes the play, drops the coverage, flip his hips, and makes the play. Notes : DJ Hayden passing off vertical route; Hayden’s recognition continues to improve and he continues to make plays. He has been an excellent tackler this entire year and gives Demaryius Thomas another nice hit. 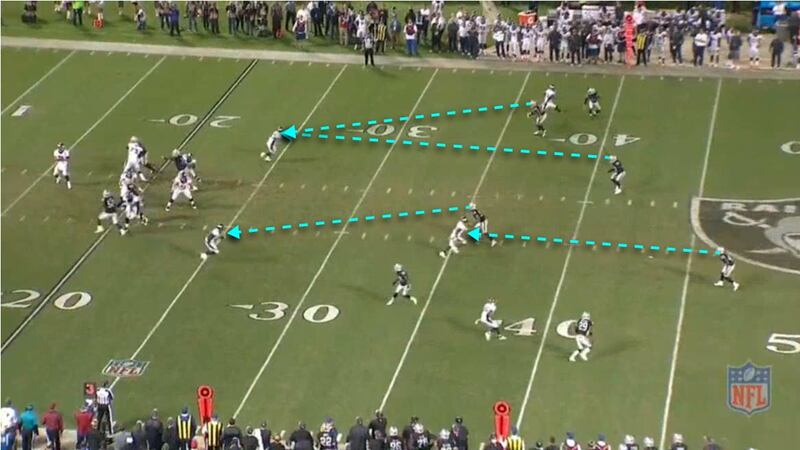 The Quarters coverage has DJ looking for the underneath receiver. The great play here indicates that DJ is growing more comfortable in the reads and his responsibilities on the coverage. Quarters may end up playing to his strengths. Notice that not only did DJ play it well, but the pickup by TJ Carrie and then the support by Reggie Nelson was also played perfectly. The defenders were just swarming around the receivers and that’s cause for optimism going forward. 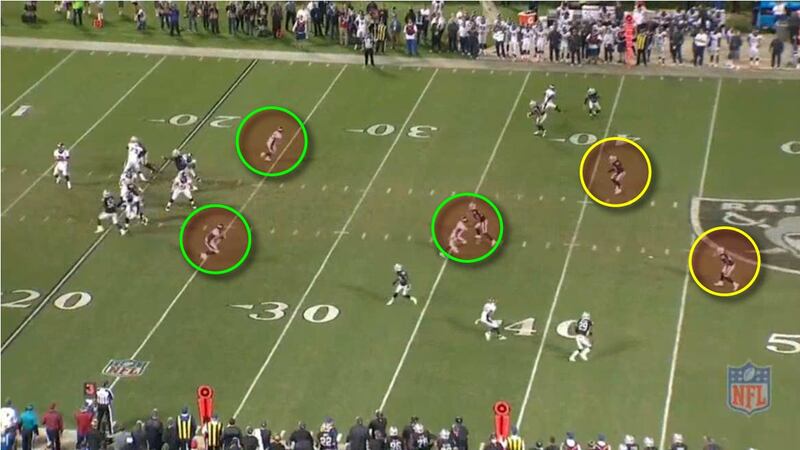 Raiders have been victimized often by Pick plays and it is a huge relief to see a response. This coverage as well as the coaching up of the defenders shows that this defense does have an answer to teams that run picks. If this were Man Coverage, it likely would have been a perfect play call and a big gain. 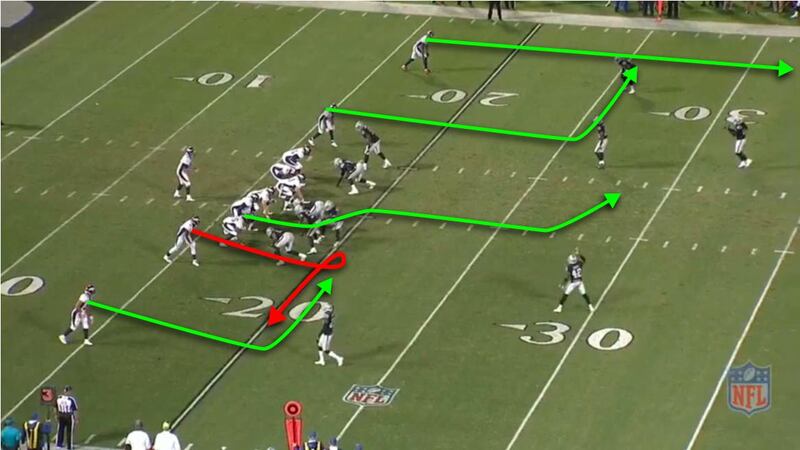 The route combination shows the natural Pick play at the juncture between the two routes. 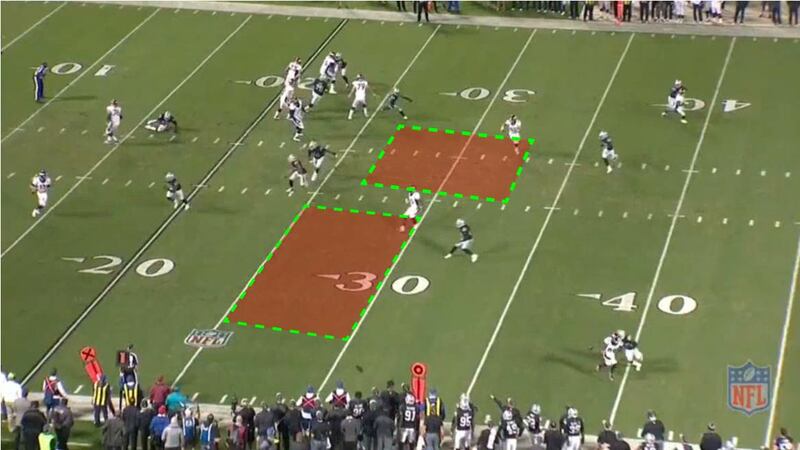 Coverage drops deep and underneath defenders matchup in their zones. Ends up with bracket coverages on downfield routes. 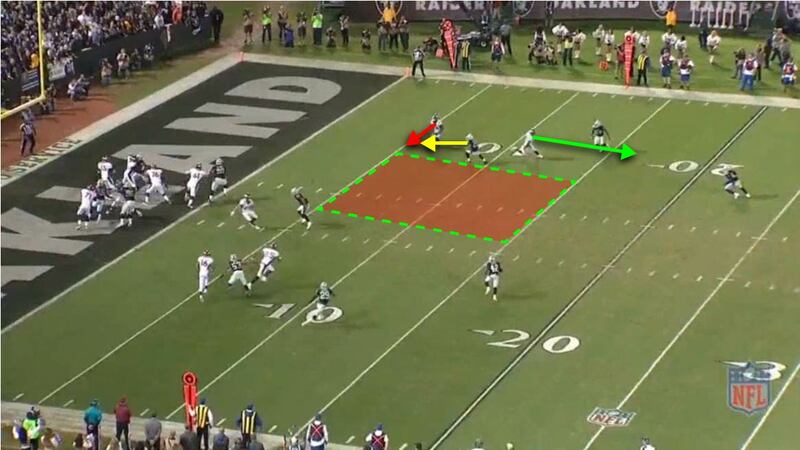 At the juncture of the Pick, here it is clear to see how Thomas runs that route to get clear of TJ Carrie. The clearout nature of these routes leaves the middle wide open. If this were man coverage or if DJ is slow to recognize, then Demaryius Thomas may be able to turn this upfield between the hashes and get to a first down and more. Instead, DJ lays the hit. 3-7-DEN 18 (4:13) (Shotgun) T.Siemian pass short right to B.Fowler to DEN 22 for 4 yards (D.Amerson). Quick Description : Confusion. Presnap motion causes defensive coverage adjustment, but not everyone recognizes and there are some communication problems. Drop 8 in coverage (including Shilique Calhoun) and has some defenders clearly out of position, but not clear what coverage is. 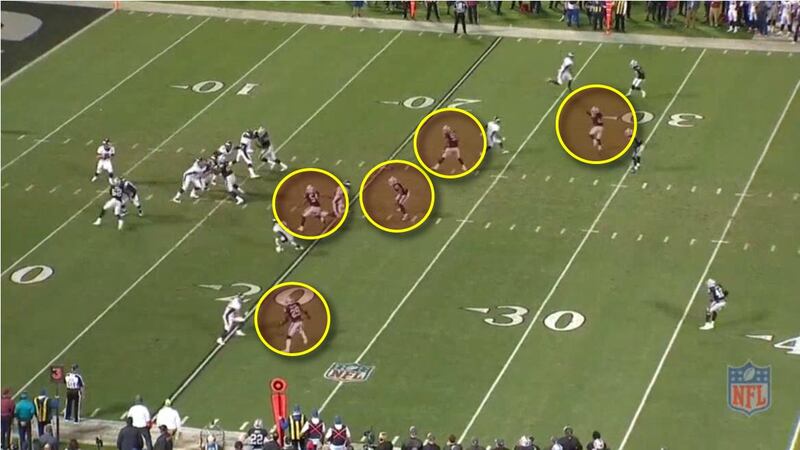 Broncos run cross/pick play but Amerson switches and make the play, similar to how DJ Hayden did earlier. Notes : Pre-snap, Malcolm Smith and Perry Riley show blitz, possibly the Cross Dog blitz that Norton likes, possibly just an A-gap blitz. If so, then likely this is Man Coverage behind it. 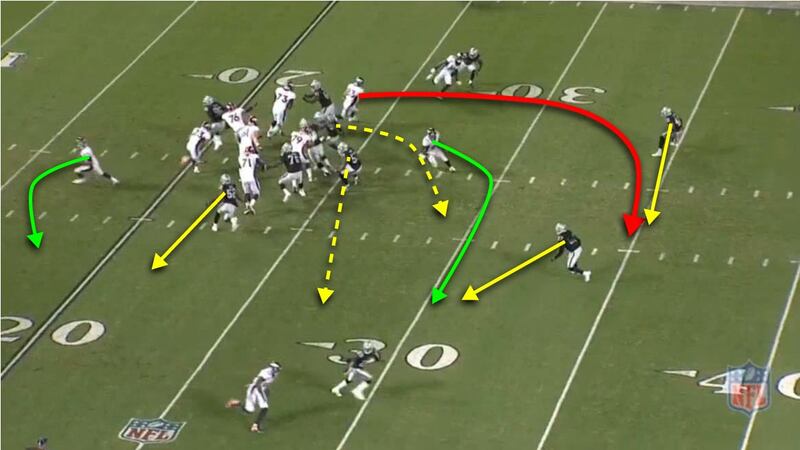 When the RB motions out, it takes the blitz off since Malcolm Smith would/should follow him outside. 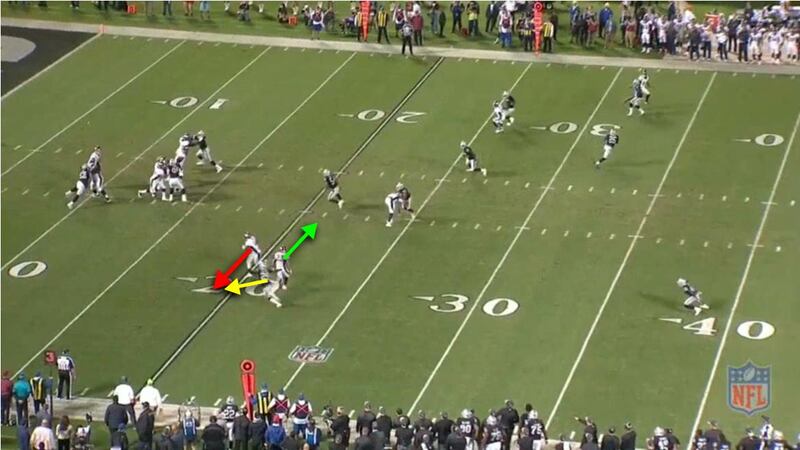 Instead, he changes the coverage or there’s an automatic adjustment. Perry Riley and DJ Hayden both appear to be confused with the coverage adjustment and it forces Malcolm Smith and Reggie Nelson to try to communicate it to them. In the play, it seems they were still confused. 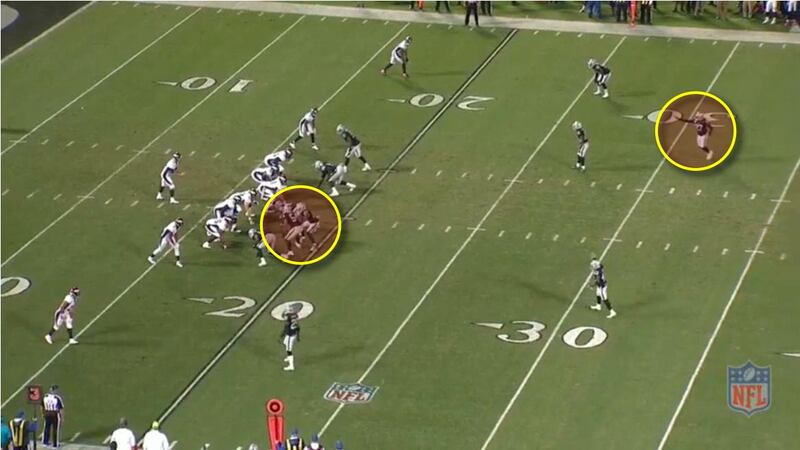 The Raiders are fortunate to have held this to a 4 yard gain. Perhaps the coverage confusion confused Trevor Siemian also. 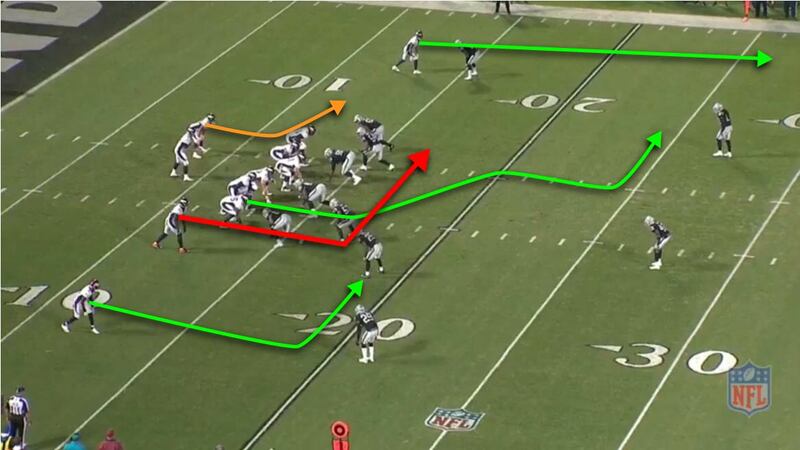 RB Motions to split wide right. The adjustment has everyone moving. Malcolm communicates to Perry Riley and Reggie Nelson is trying to get DJ Hayden’s attention. Pick play to the outside is where the ball will go. There are 5 underneath defenders, including Shilique Calhoun. Reggie Nelson seems to be pointing the flat coverage to DJ; when DJ doesn’t respond, Nelson takes that coverage. So this may not have been the coverage design. Amerson is playing the flat. It appears he is playing the outside zone and that Perry Riley should be playing the adjacent zone. 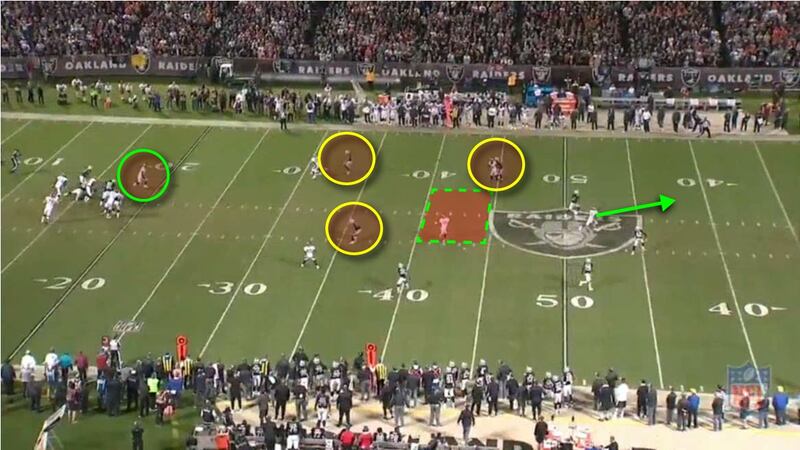 Instead, Riley is keying inside further and leaving Amerson isolated on 2 receivers. The two receivers cross and put Amerson in jeopardy. Like DJ Hayden before, Amerson either recognizes the outbound receiver or he is playing the outside zone. 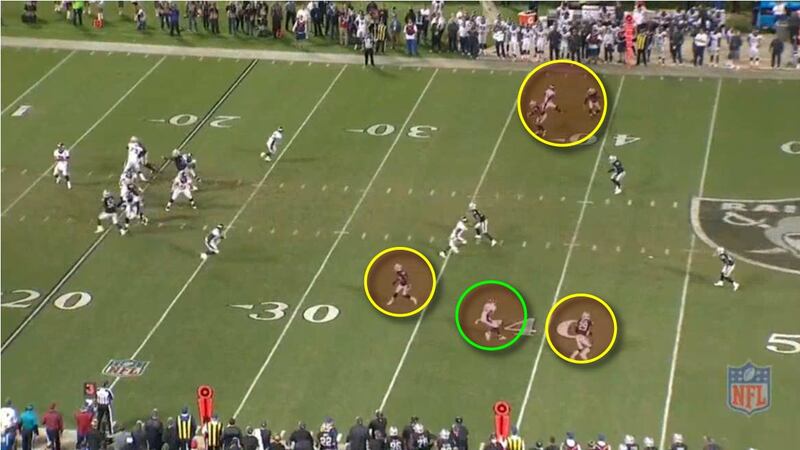 So when the receiver comes to him, Amerson makes the play. A throw to the other receiver (the in-cutting receiver) may have been a big gain. 3-14-DEN 26 (2:28) (Shotgun) T.Siemian pass deep middle to E.Sanders to DEN 44 for 18 yards (D.Hayden). Quick Description : On 3rd and long, defense sags deep to the sticks and the zone coverage has things initially covered up. Siemian breaks the pocket to buy extra time and then finds Emmanuel Sanders on the dig just past the first down marker and into a hole in the zone. Notes : Initial coverage is excellent and there is nowhere for Siemian to throw. Deep routes are all covered and the underneath routes are far too short. Perry Riley loses track of the receiver behind him and he opens up a big hole in the zone that is exploited. While appears to be Quarters coverage, this also has a Cover 3 type look to it, particularly with Nelson looking underneath and not dropping back. 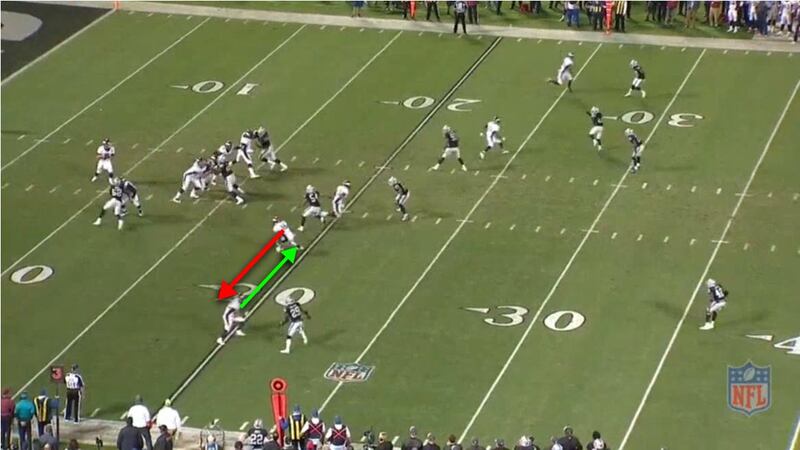 Nelson ends up in an inbetween spot, stuck between deep Quarters and underneath Cover 3. This may be intentional or it may be a result of Nelson’s play. 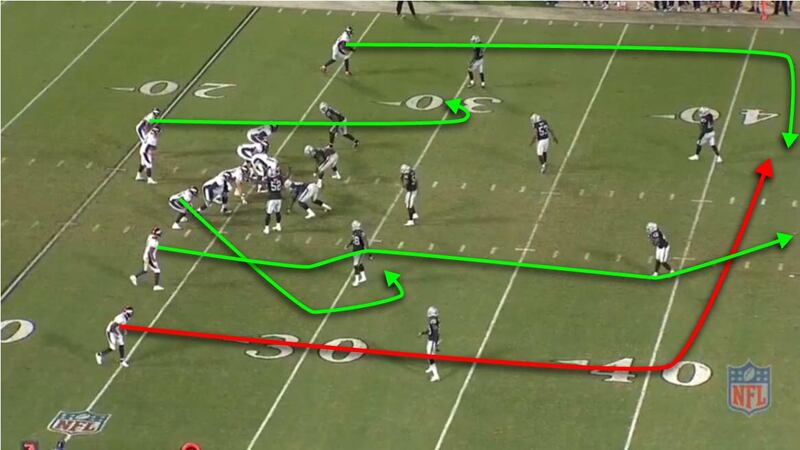 Line to make is the 40 yardline and the downfield routes attack that marker. Meanwhile two checkdown routes. Looks like Quarters with the underneath defenders sinking back to protect the 40 yardline. 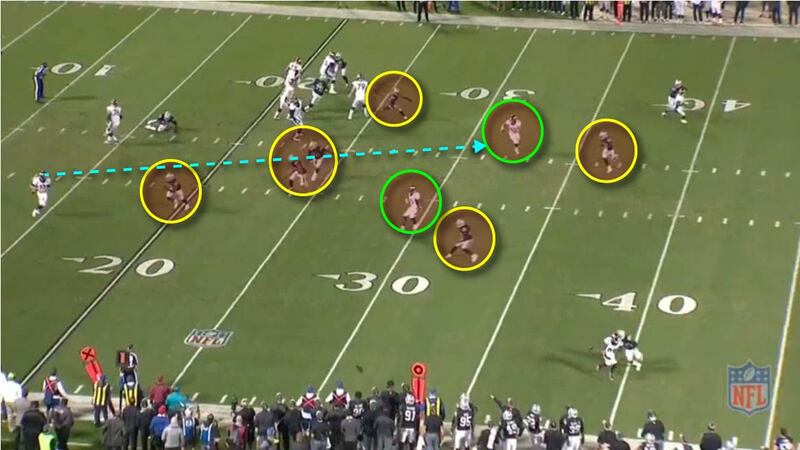 By having underneath defenders sink back, it allows for a natural high-low bracket coverage on the outside receivers. 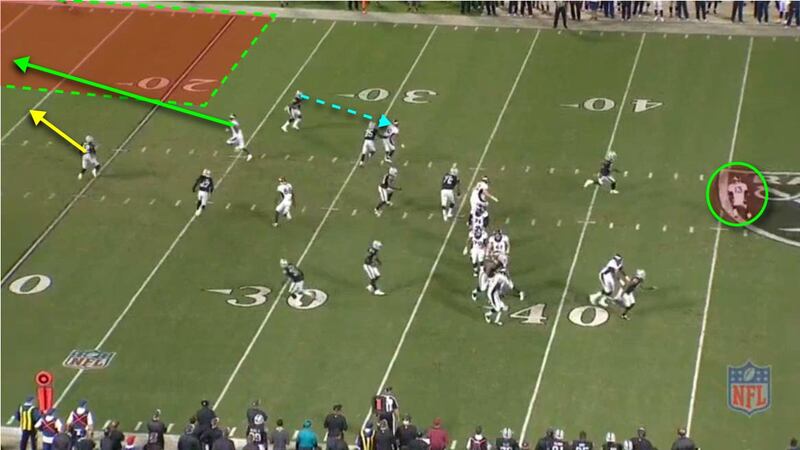 The deep interior receiver has to navigate potentially 3 defenders and to find a place to go. 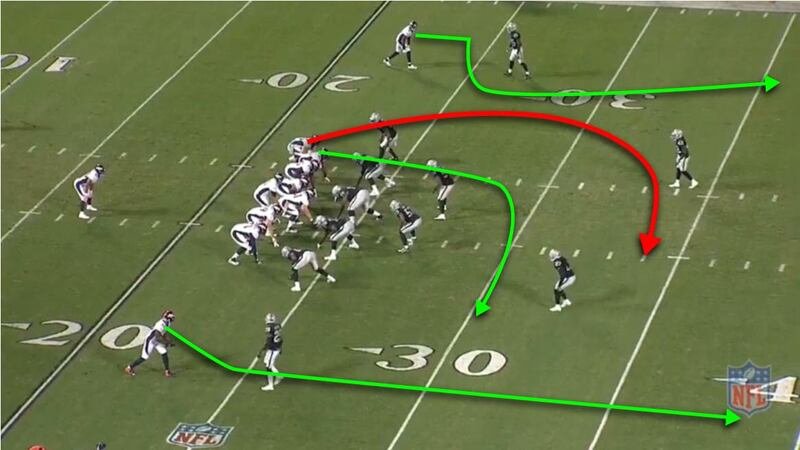 Underneath him, the checkdown receivers release into the pattern. Karl Joseph picks up the vertical route in the middle of the field. Perry Riley knows he has help over the top from the safeties and is looking at the underneath receiver. DJ Hayden and Reggie Nelson both appear to be looking at the other outlet receiver. At this time that it is unclear if Nelson is intending to play underneath for Cover 3 or if he’s to drop back for Quarters. 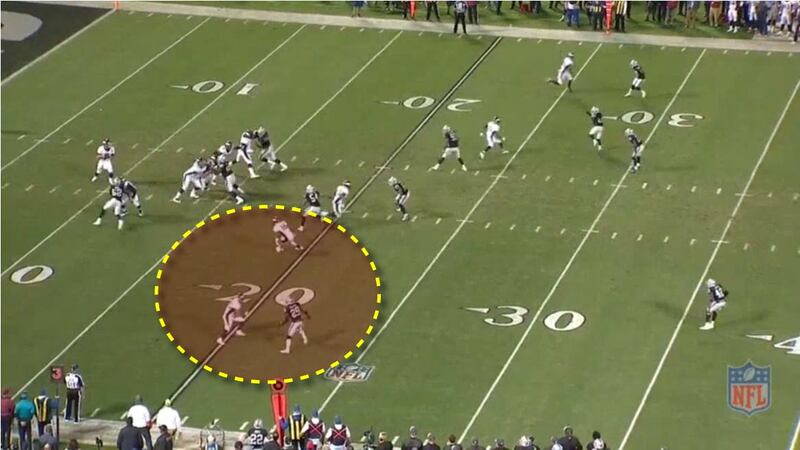 Especially with how DJ Hayden widens his coverage to the sideline. Here are the interior routes and the reactions of the coverage. Malcolm Smith wides to the numbers on the defensive left side. 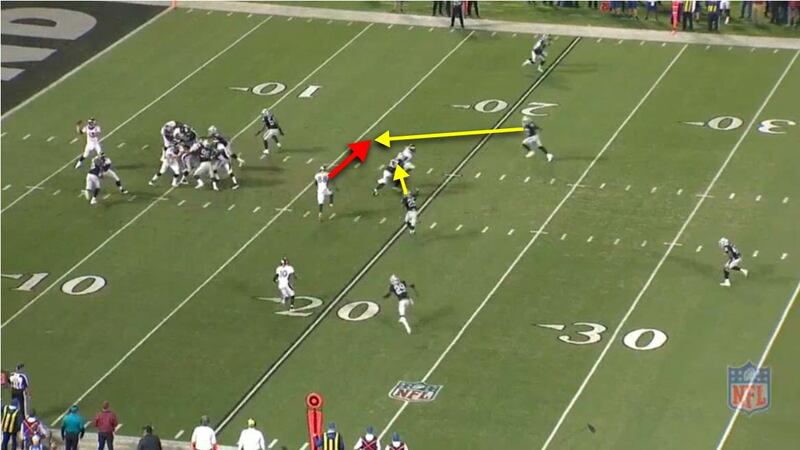 On the opposite side, DJ Hayden will drop down to take the underneath receiver. Perry Riley in the middle of the field will be drawn down by the underneath receiver. The vertical route pulls both safeties deep. This shears the defense and opens up the intermediate middle. Emmanuel Sanders cuts across right into the opening which the defenders are vacating. Riley, Hayden, and Carrie leave a hole and Siemian is able to make the throw into it for the first down. The defensive statline was clean, 18/37 (49%), 283 yards, 2 TDs, 1 Int. 81.2 passer rating. The coverage passed the Eye Test; on superficial viewings, the coverage looked very good. But closer inspection reveals that this defense is still growing into what it will be. There are still these Growing Pains as some players are missing assignments or getting confused and at times, the communication is not quite there. The coverages are requiring a great deal from each player and they are each at different levels of understanding and execution, leading to some uneven looks on the field. Fortunately, the Broncos’ QB and their offensive line was not able to properly exploit all these problems or else our view on the game may be very different. The most encouraging part is that the defense is substantially improved over what we saw earlier in the year. There are some mistakes but far fewer outright blown coverages than what we saw against New Orleans and Atlanta. The players are definitely playing much faster and they are doing a lot of things right and are taking things away initially, challenging passes, and overall forcing difficult plays. The old saying goes "You can’t take everything away." What this group is starting to show is that they are capable of taking SOME things away for a while. Perhaps the most exciting part of this study is that it revealed that the defensive coverage scheme is still also growing and that it’s starting to take on interesting hybrid characteristics. We may have to nickname the defensive secondary "The X Men" because they are becoming a mutant offspring of Coach Del Rio and Coach Norton. The exciting part about this is that there’s a potential for a unique and devastating defense, especially as they are recruiting and growing the players to fill these roles at the same time as they are defining these roles. There are some growing pains yet to be experienced, but this Bye Week is going to help tremendously. They have an extra week to determine where the confusions lie and to clean that up. Expect them to play a very strong, clean game this coming week and then to keep improving down the back half of the season. What was once the Achilles Heel of the team may grow into a strength.